Coffee With Games: Coffee Shop - The Last Story for $8 on Amazon.com! 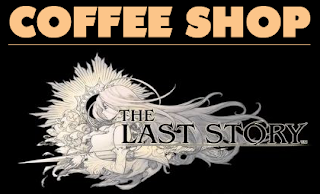 Coffee Shop - The Last Story for $8 on Amazon.com! The title says it all really, The Last Story is currently on sale for only $8.00 on Amazon.com! I just did the debut data report on the game not even 2 weeks ago, which you can read HERE. For $8.00, if you're like the average Wii owner that has reported data from the game, you should be able to expect at least around 18 hours of gameplay from The Last Story. If you have been interested in the game, now is probably the best time to grab it if you wanted it, or are thinking about giving it as a birthday or Christmas gift this year. You can buy it now and just leave it in your collection of games as an incomplete game if you have a big backlog of games, which is not necessarily a bad thing; and if you grab it on sale that means there is more money, for more coffee in your pot! Grab it while you can, HERE (and below), as I'm guessing this sale won't last long! Seriously though, that's a good price for the game, and worth picking up since most people seem to enjoy it. And if you're like me and hate the game with a passion that rivals the fires burning in a million hells, then it's only a wasted $8. Low-risk investment right there. Gah! I totally didn't see this in time. When I looked it up today it was back to full-price. I would have totally purchased it at $8. I'm a RPG-o-phobe and may have even purchased it at $8. Sale didn't even last a day. More likely the amazon stock ran out and all the 3rd parties are charging more now. Yeah, from what I just saw on a comment, it looks like it lasted maybe an hour at most! I always troll Amazon late (early depending your time frame), and spotted it on my nightly troll. LOL, I'm sure you have gotten 10 billion hits from that link in the last 2 days, with my amazing web traffic right...and THAT's how you knew the link was there. You're right about the sale, it wasn't very long, but the fact it was that cheap at all is still crazy to me considering the game isn't even that old of a release. Watch the Wii U game prices.